This is a list of direct-controlled municipalities and provincial cities (in Mainland China) by gross domestic product (GDP). Shown here are GDP figures publicized in provincial-level Statistical Yearbooks or official statistical communiques. All GDP figures are based on the national currency Chinese yuan (code:CN¥)，for an easy comparison they are converted into US dollars according to official average annual exchange rates, purchasing power parity (PPP) according to comparison of IMF WEO figures. ^ The annual average exchange rate of CNY to HKD: CNY 0.8713 per HKD in 2010. ^ The annual average exchange rate is CNY (Renminbi) 6.7695 per USD; 7.7692 Hong Kong dollar (HKD) per United States dollar in 2010. also see List of Historical Chinese yuan exchange rates. ^ All the GDP figures are recent statistical revisions from statistical yearbooks of provinces pubulished in later 2011. ^ According to IMF WEO data, the PPP is CNY 3.9460 per international currency in 2010. Hong Kong GDP PPP is from IMF WEO data (September 2011). ^ Nominal GDP is based on the official annual average exchange rate at CN¥ 6.7518 per US dollar; PPP GDP is based on IMF WEO Data April 2018, the average exchange rate is CN¥ 3.5063 per International dollar. 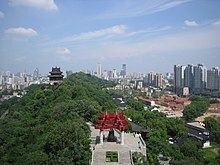 ^ a b c d e the 2013 GDP figures of Shanghai, Beijing, Tianjin and Chongqing are revisions based on China Economic Census 2013, see China NBS: National Data - Regional - annual by province; Nominal GDP is based on the official annual average exchange rate at CN¥ 6.1932 per US dollar; PPP GDP is based on IMF WEO Data October 2014, the average exchange rate is CN¥ 3.6329 per International dollar. ^ Original GDP figure of Hong Kong SAR is HK$ 1,743,858 mil. (revision, instead of the former 1,748,090 mil.) from Hong Kong Census and Statistics Department, It is converted into CN¥ 1,519,423 mil. ( CN¥ 0.8713 per HK$) or US$ 224,458 mil. (HK$ 7.7692 per US$).